The group meets on the first Friday of each month starting at 18:30 and finishing by about 20:00 to 20:30. Tea and coffee can be purchased at each meeting from a counter in the meeting hall. The venue is the meeting hall in St. Andrews church, which is next to the Royal Berkshire Hospital and is located at the junction of London Road and Craven Road. New members are most welcome to attend, and they will be greeted at the door on arrival by a Committee Member, who will advise of the proceedings that evening and introduce you to other members. New members may if they prefer, contact in advance of a meeting, one of the people listed on the Contacts page. The approach by car is along the one-way London Road, and turn left into Craven Road; set your SatNav to RG1 5BD. The map below shows parking locations. At busy times for parking in areas 1 and 2, drivers may find it difficult to make a right turn into the car parks, if so you can continue to the roundabout and then come back along Craven Road, turning left into the car parks. Important: For your safety and to comply with the hall Fire Regulation, please park only in the bays as marked. 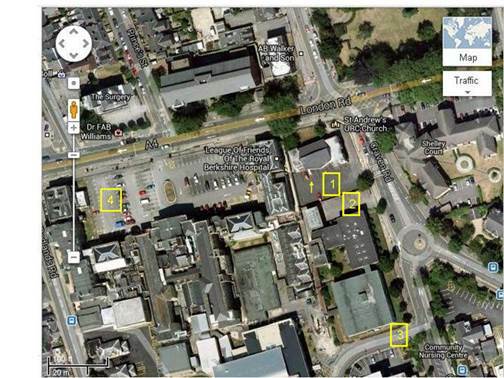 See below a copy of the satellite map for detail of car parking. The yellow arrow in area 1 indicates the entrance door to the meeting hall. A road map - thanks to Google - is included further down this page. From either London Road (one-way street) turn left at the traffic lights into Craven Road or straight across London Road from Eldon Road and turn into the first opening on the right. During any busy period it is usually safer to go up Craven Road about 100 yards and around the mini-roundabout and then turn left into this Car Park. As Parking 1 but the second opening on the right; the parking area is underneath a sign stating ‘Trust Education Centre and Library’. You need to display a parking permit on your dashboard, that can be obtained from David Priest. From London Road (one-way street) turn left into Craven Road then bear right at the roundabout. Take the first road on the right, which will take you into the hospital multi-storey car park. Take a ticket at entrance barriers and pay at a pay station before returning to your vehicle. Charges are £1.50 per hour. Approaching along London Road, continue past Craven Road and turn next left into the driveway in front of the hospital, and park in the area reserved for Staff, on the right as you drive in. You need to display a parking permit on your dashboard, that can be obtained from David Priest. Below is the Google Map of roads of the area where we meet - the balloon arrow points to St Andrew's Church. You can also click on the 'Sat' box to see a Satellite picture from which you may wish to click on the '+' button twice to enlarge it and then holding down the 'left click' on your mouse move the satellite picture to see plenty of detail - fortunately the Satellite photo was taken from the South side revealing the entrance to St. Andrew's Hall with the adjacent Car Park No. 1 above. A copy of our Parking Permit may also be usually obtained from our Chairman: Ted Goodhew Please note that this permit is not valid in the multi-storey car park of the RBH, if you choose to park there you will be charged. For venues used for other events - visit Monthly Meetings and Events pages.